European Union authorities have started checking whether the American online retail giant Amazon.com is using its merchants’ data to eliminate competition and gain an unfair advantage. Questionnaires are being sent out to Amazon merchants to collect more information. Amazon may be guilty of using the sales data of the merchants it hosts, to gain trends’ insights and make business decisions that compete with the same merchants. What kind of data Amazon has that it can misuse? By virtue of being the platform through which every single transaction happens, Amazon has access to unimaginably large data. Once you’re on its site, it can track every mouse hover, every click, every product browsed and pretty much everything else. The Amazon’s business model will help you understand the situation. Why is EU opening a probe against Amazon? The EU is trying to figure out if there is evidence Amazon is trying to monopolize the market by using practices that go against widely accepted anti-trust regulations. How’s Amazon trying to monopolize the market? How’s Amazon using the data it’s collecting from its merchants? Business Insider reports Amazon has 76 private labels – brands that are grown by and sold exclusively over Amazon. From baby wipes to vitamins, computer accessories to clothes for women and batteries to ovens, Amazon has been steadily pushing its own brand. All this, it is suspected, has been done with help of data it collects from the sales of those merchants who sell similar goods (but of different brands) using the Amazon platform. This data, brands and merchants claim, is used to find out which product categories are the most profitable to enter. Based on this, Amazon zeroes in on categories it should build its own private labels in. Slowly but steadily, these labels begin getting higher rankings in the search results users conduct while looking for products. Amazon’s voice-activated virtual assistant Alexa too seems to place Amazon’s private labels over others. This results in lowered sales and loss of revenues for other brands. Some consequences are obvious: businesses closing down and people losing jobs. Others are more long-term: stifling competition means we see fewer innovative startups survive. While it’d be unfair to exclusively blame Amazon for all this, most experts and industry observers agree Amazon has been the biggest factor. And the jobs lost with these closures all aren’t going to Amazon. Some these jobs may be vanishing. 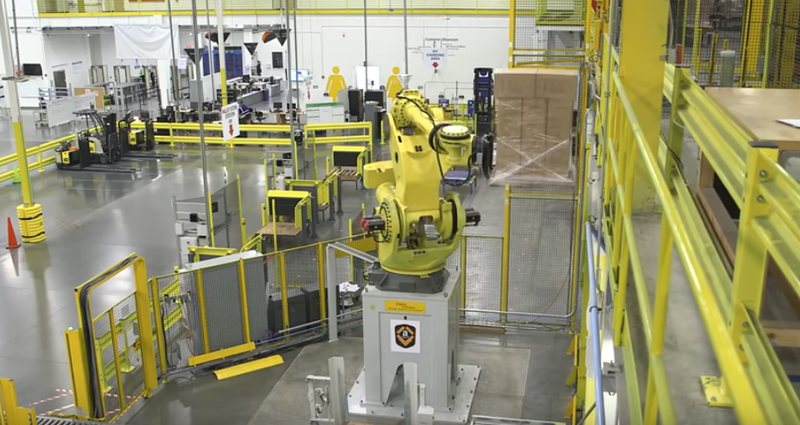 Here’s a screen-grab from a YouTube video: the robots are doing a lot of work. These jobs were earlier done by humans – now these jobs are lost forever. How data makes Amazon stronger? Kai-Fu Lee explained in The New York Times how data gives enormous leverage to companies and countries. There is no doubt that EU laws are becoming more difficult and companies are finding it increasingly difficult to remain compliant. The enormous amount of data Amazon feeds into its AI makes it nearly impossible for any other company, forget startup, to ever pose a challenge to Amazon. Venture capitalists and angel investors understand startups will never succeed in challenging Amazon so they aren’t keen to support such startups. As a general rule, it’s the startups that bring disruptive innovation, not large corporates. With startups no longer being supported, we’re going to see a lot fewer innovations. Whatever few companies do survive, are soon taken over. Sometimes, the deals are done in secrecy so people keep believing they’re buying from an Amazon competitor when they’re actually buying from an Amazon subsidiary. So what can such investigations, and even fines, hope to achieve? Current antitrust laws were framed so that they could protect consumers from pricing cartels, like the way oil companies of the US did at the turn of the 20th century. These laws are hugely inadequate to deal with the kind of clout Amazon and similar companies can bring. However, investigations like this do slow down companies like Amazon and prevent them from killing further competition. And that, hopefully, gives the time required to lawmakers to frame better laws that are more suited in the current internet economy.